It’s past the middle of the month. That means that I am very late in presenting the final numbers on December 2018. Was December even a month? It certainly didn’t feel like it. December always seems to fly by because the last 10 days are a wash with Christmas and New Years. This year we went on our annual vacation to Aruba on the 15th, coming back on the 22nd. On the 26th we started a fairly major home renovation. So as far as productive “work” went, it was literally half a month. Subtract out the time to pack for the trip, shop for Christmas, wrap, and get everything else done for the holidays (we hosted a small Christmas at our house), it was closer to 10 working days. I can’t tell if I’m complaining about it or not, so I don’t know what you must think. I suppose I’m complaining about the rush of everything. However, what’s not to like about a week in Aruba and seeing the joy of your 5 and 6 year old open up their presents. This year, we probably try to do the vacation another time. I’ll be randomly adding other personal family events throughout. This way you can choose what’s more boring: these financial numbers or some random guy’s family events. It’s not going to easy. Regular readers probably know that I use 90% of the previous article to make this one. Someday, I hope to separate the most of the explanations to a FAQ and then just give you the new details. For those that don’t know the term, “alternative income”, I started using it around 12 years ago to be purposely vague. I needed something to cover the small amount of blogging income I was making, while I growing my peer-to-peer lending portfolio as an income stream. (The P2P worked for a bit, but I’ve soured on it over the last few years.) Blogging income can be very erratic, but there’s a residual nature to it as well. Some popular bloggers are still struggling to categorize the nature of the income. I think alternative income was more passive back in 2007 before social media, podcasting, and video. Today it seems like every blogger talks of hustling (as in moving quickly, not grifting people) and by that they mean “being everywhere.” I feel like the only one dumb enough to just keep writing blog posts… blog posts that often don’t have cool “pinnable” images. In general, I call alternative income everything that comes from passive investment and these side hustles. The best way to think of it is income where you aren’t directly trading your time for money. This report is about all my alternative income. To include my investments into that paradigm, I have to fudge the numbers a bit. You’ll see what I mean as we go along… or you can see a more detailed explanation back in January, 2017. 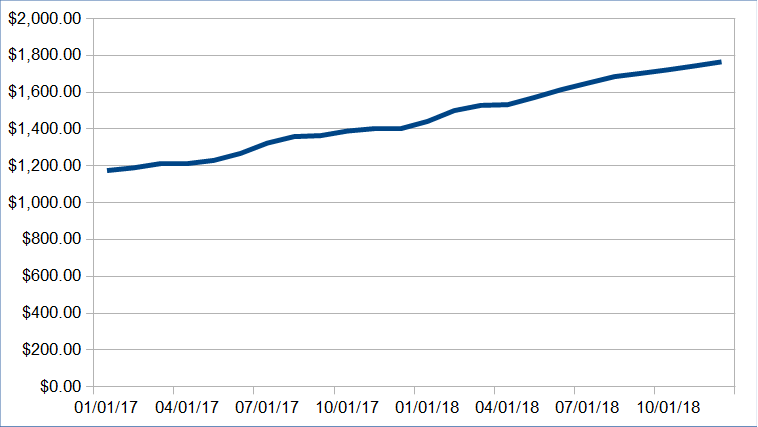 The last month I reported, November 2018, my alternative income added up to $6,786.37. That was more than usual with a lot of dog sitting clients over Thanksgiving (and sweet holiday rates). In any case, November is ancient history now, so let’s move on to more recent history… December. 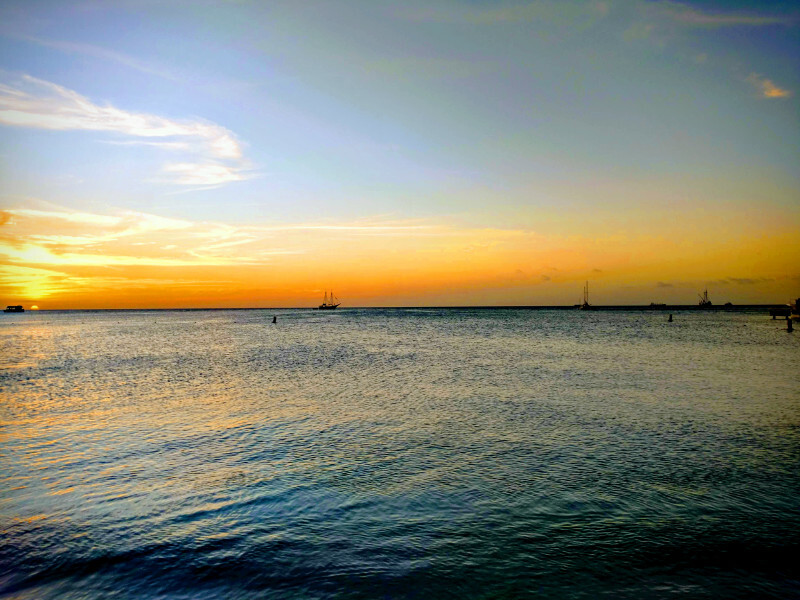 This was a sunset in Aruba. I was completely unprepared but was able to run onto the beach with my phone and catch it at the last second. I suppose the best answer is that I’m a stay-at-home dad. The kids go to school for about 8 hours a day during the week. My “non-Dad stuff” is 40 hours a week. That gives me time to do some basic family errands (shopping, cooking, dishes, laundry, walking my own dog, etc.) and dog sitting and blogging fills in the gaps. Over the last several months, I’ve taken two extra paying side gigs. I’m a blog editor for one company and I’m a customer support representative for a different company. That might seem like a demotion from my software engineering days, but the hours are flexible and the pay is good. With these two jobs, it’s certainly easier to convince people that I work. Time to move off that soapbox. I don’t publicly break out the difference between blogging income vs. dog sitting income. One impacts the other. When I have a lot of dogs, I don’t have as much time or the focus to blog. When I’m blogging a lot, it’s usually because I don’t have too many dogs to sit. And both are impacted by how much time I spend on the contract side gigs. 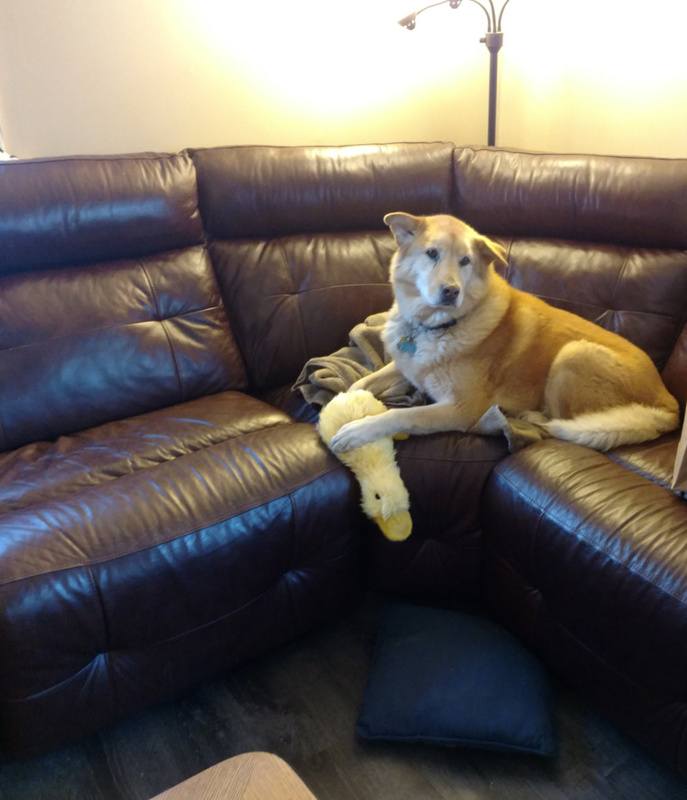 If you are interested in dog sitting, I wrote a very detailed article on the subject: Pros and Cons of Dog Sitting on Rover. 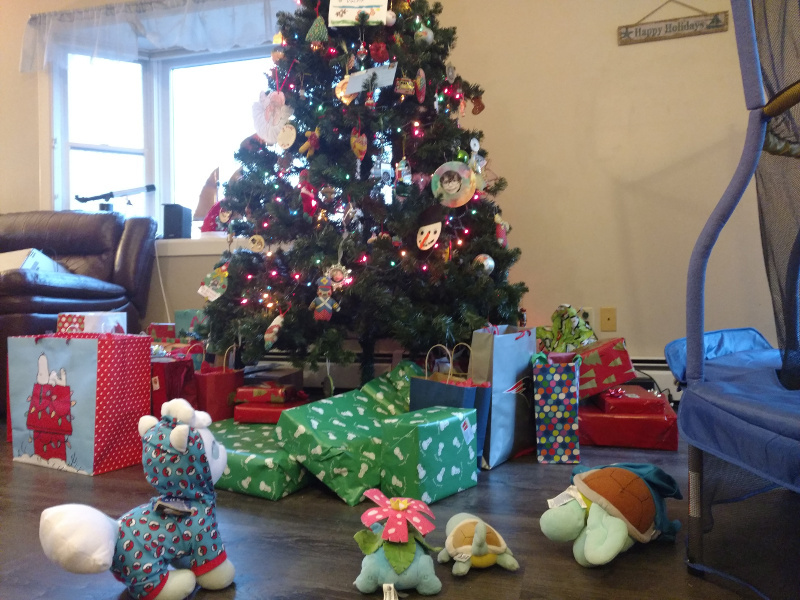 The Pokemon stuffed animals were shocked by the presents on Christmas. Vulpix unfairly got a present from one of my son’s. I fear the other Pokemon are plotting a Vulpixicide. Blogging is usually much more time-intensive than sitting dogs. (The summer months are the exception). However, it isn’t directly trading time for money either. If I write an article for the blog today (such as this one! ), I don’t necessarily get any significant money for it. 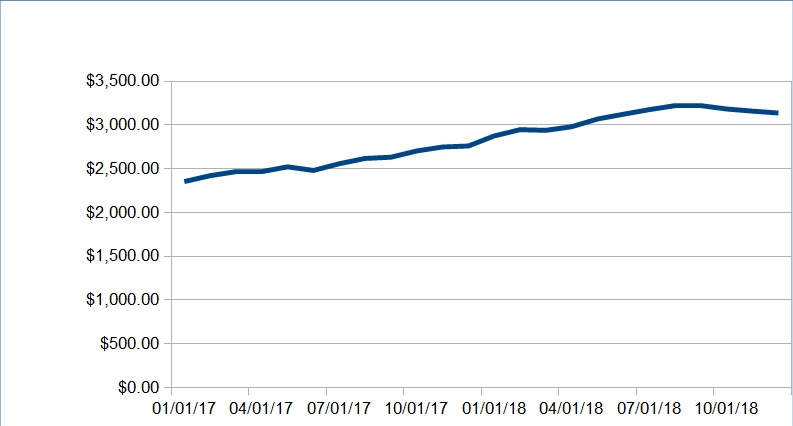 The money I make from blogging now is a direct result of having built a reputation and a collection of nearly 2500 articles over 13 years of blogging. December was the worst month for dog-sitting of the entire year. It was terrible. Between vacation, the holidays, and the home renovation, I wasn’t available to do much dog sitting. It’s a bit of a shame, because it could have been a very good month as other people travel and leave their dogs behind. Blogging income was almost exactly the average. It’s doesn’t get any more boring than that. That’s the lowest of the year. I thought I’d be more disappointed in the low number, but I think most people would be very happy with nearly $2500 month from what is essentially their 3rd priority (after family flexibility and the contract side gigs). 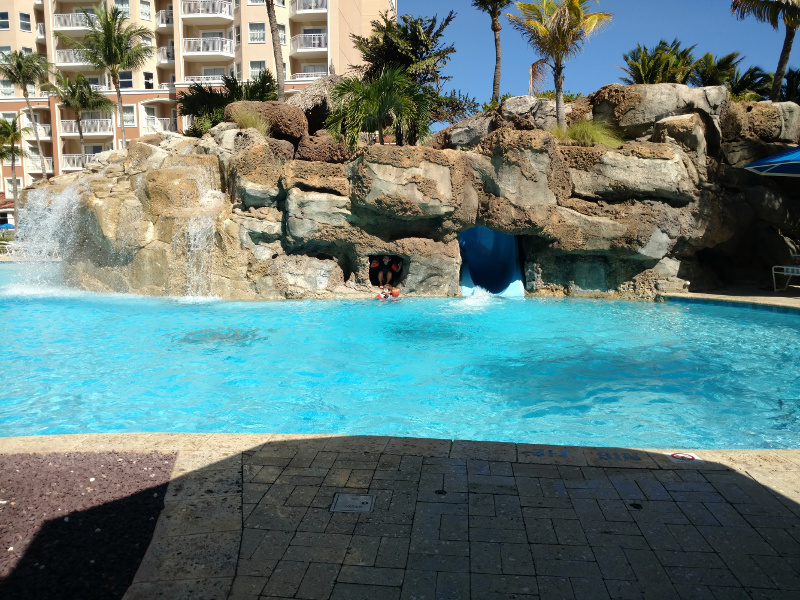 This is the water slide where we spent most of our time in Aruba. The kids are hiding in a little cave area in this picture. I add up all the properties equity and values. Zillow is very accurate for these condos – it has a lot of data points to work with. Next I calculate an equity-to-value ratio. In short, this is the percentage of the property value that we own vs. the bank. Then I calculate the rents of all the properties as if they were owned free and clear. Thus we can say that we are “banking” (in a completely fudgey sense) a percentage of the rent that we would expect to have in the future (rents are typically in line with inflation in the simplest sense). If you are confused (and you probably are), this article on calculating cash flow of cash flowless real estate explains it in more detail. Here are the numbers for December. We have 53.07% of the equity in our properties with an estimated combined rent of $3,325. The rent number is after insurance, property taxes, and condo fees. That’s so we can estimate what we’d really be taking home after expenses. 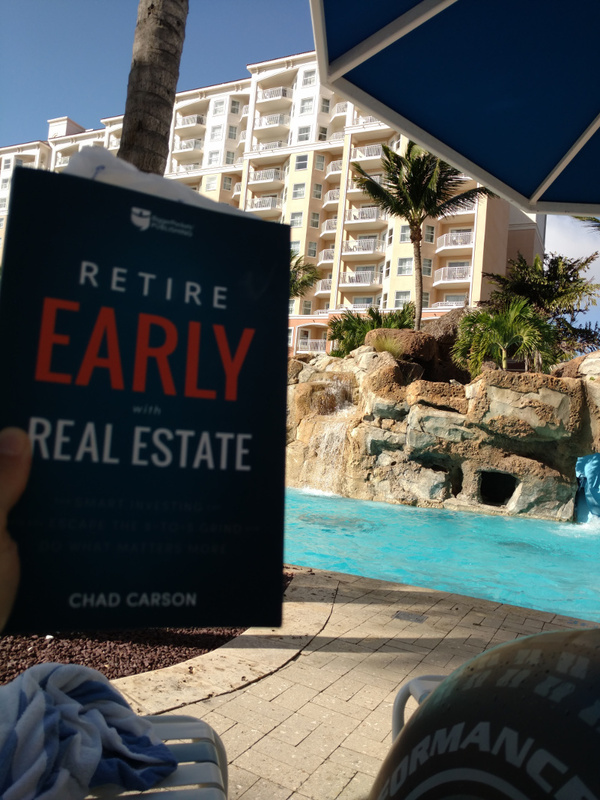 I brought Chad Carson’s Real Estate Book with me. I need to review it sometime soon before I forget all the comments I had… and there were a lot! If you multiply $3,325 by 53.07% you get $1,765 in “fudged” monthly alternative income. When I started tracking this (beginning of 2017), we only owned 36.4% of the properties and they had lower rents. The math worked out to $1,174 back then. So in 23 months, we’ve seen the number grow $591/mo. That’s like giving ourselves an annual $7,092 raise until the end of time. As the years march on, the ratio will grow to 100% of the $3,325 monthly inflation-resistant rent. That’s what gets us to that annual $40,000 I mentioned above. In the previous report, the rental property income was $1,743. This number usually moves slowly, so we’ll take the $22 increase. This number only changes if one of two things happen: 1) The properties go up in value. 2) We charge more for rent. I don’t control the housing market. Tenants are typically locked in for at least a year. The monthly paying down of the mortgages creates some equity each month. 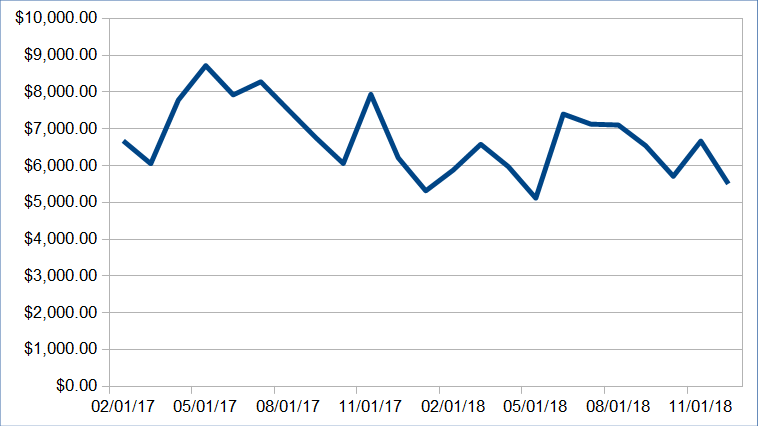 That’s where we saw the gains in December as the values of the properties stayed mostly the same. Slow and steady wins the real estate race. In previous reports, I hoped that by the end of this year, we’d be looking at having 50% of the equity with $3,325 in rent or $1662.50 a month in fudged alternative income. As the properties have appreciated, we passed that mark earlier than I expected. We are still opening and playing with some presents (especially the robots that require a little more time to learn.) 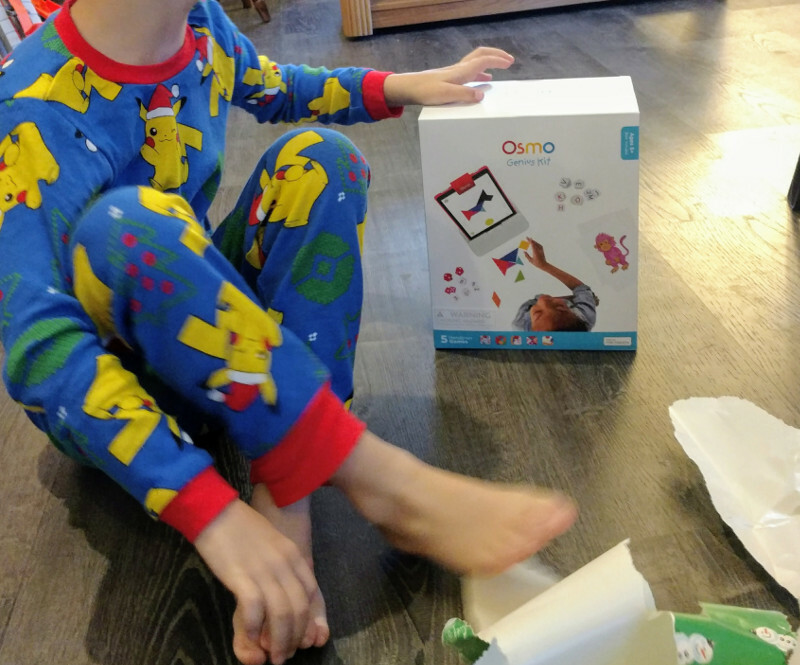 However, Osmo seems to be by far the best toy. I plan to write a review at some point. Last month, it was $1417, so we lost $45 of theoretical monthly money from theoretical dividends. In the last three months we’ve lost $150/mo. That’s a lot, but it’s still just a drop in the bucket compared to what the stock market has given us over the last 9 years. 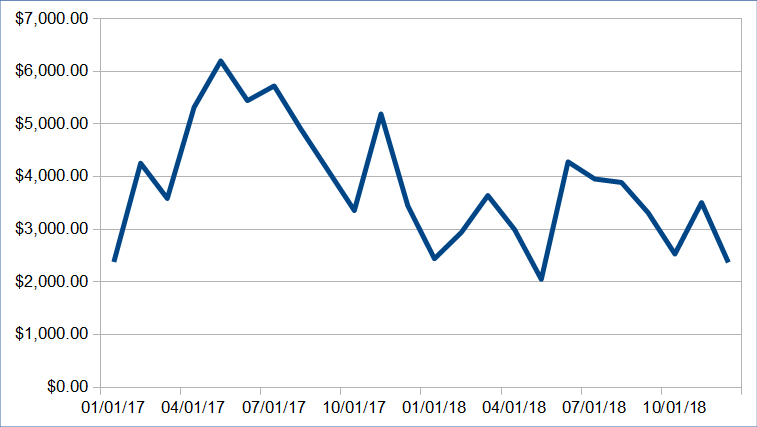 It’s already bounced back a bit over the last 10 days since I captured these numbers. At the start of the year, the dividend income was slightly ahead ($48) of the rental property income. It’s like the stocks vs. real estate debate, but for our personal finances. Now the difference is $393 in favor of the “real property income.” Real estate has decisively won the battle in 2018. Jake loved his Christmas duck. He would have liked the real thing a little more, but he can never catch them. The stock market goes up and down which makes the dividends fluctuate as well. The rental property income keeps going up, because the mortgages are always getting paid down every month. The stock market can move a lot faster than the housing market. In any case, I like having both of them working for us. Last month it was $3,159, so it’s down $22. It didn’t go down for the first 18 months of reports and now it’s gone down each of the last three months. However, it has grown from a combined $2,354 in January 2017. Since then, this has gone from an estimated annual income of $28,252 from these two sources to $37,645. It’s worth noting that, once again, these are fudged numbers that aren’t “real” yet. However, I’m looking forward to 9 years from now when the mortgages on the investment properties are paid off. Add in stock market growth (of a conservative 4%) and this number could reach $80K a year. I have ignored some minor (but important) details. Details such as our investments being in retirement accounts. 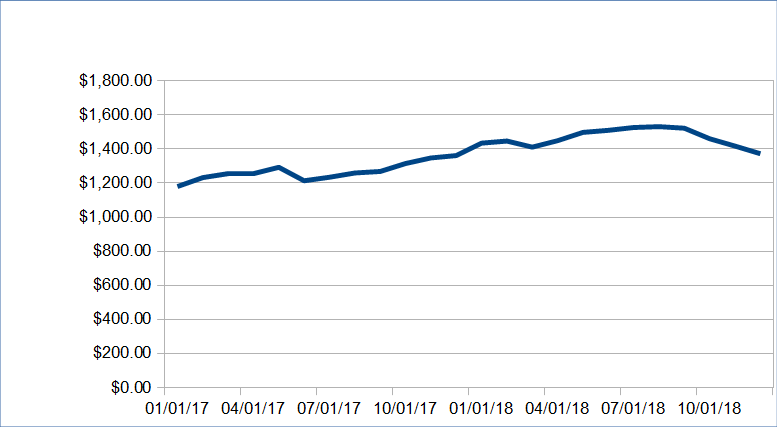 Adding up “dogs and blogs” to the “very close to passive income”, this month we on the investment stuff had $5,505.44 in monthly “alternative” income. That would be $66,065.28 a year. Last month it was $81,436.44, so the lack of dog sitting really hurt the projections. The short term fluctuations are just noise of how well “dogs and blogs” did in any particular month. That largely hypothetical ~$66K a year on investments, writing on a blog, and taking care of dogs feels a little like a dream (probably because it is). In the long term, we can get by on less than half of that income. That doesn’t include any of my wife’s bread-winning pharmacist income, her potential military pension if she retires next year, or any of that freelance work I’ve been doing over the last several months. Since I don’t share real numbers of our net worth, this isn’t very exciting. That’s why it’s just a footnote. In December, our net worth went DOWN 0.43%. Ouch! That’s 4 consecutive months of going backwards. Don’t the markets know that they always have to go up so I write nothing but positive, encouraging articles? In 2018, our net worth was up 7.31%. It’s easy to feel negatively about that after seeing it going up an average of 17% for a large number of years. However, with stocks down for the year, it highlights the power of diversification in real estate and saving overall. I seen other bloggers report losses of the net worth over 2018. How was your December? Let me know in the comments.